you’ll get help through every step of your design education. When you enroll, you gain access to QC’s friendly and experienced Student Support Specialists who are ready to assist you and answer your questions. As you work through your course, you’ll be guided by a professional designer with years of experience in the industry you’re studying. Even after you graduate, you’ll remain an essential member of the QC community. You’ll build relationships with other designers and be connected with business resources that will help you succeed in your home design career. Wondering about the scale to use on a floor plan assignment? Need clarification on your tutor feedback? Reach out as often as you need to discuss your course materials or to ask questions about your assignments. Whether you’re a student, a graduate or are considering enrolling, we are always happy to hear from you. 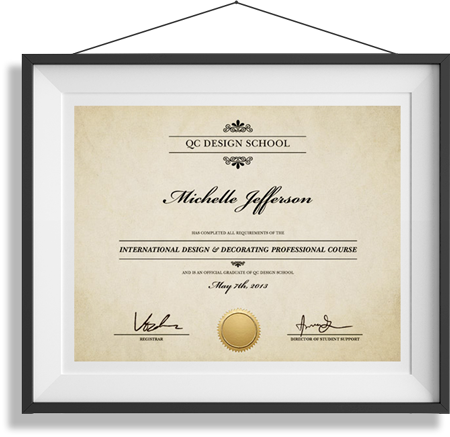 Contact QC Design School by phone, email or Live Chat – whichever you prefer! In order to be the best, you have to learn from the best. That’s why when you enroll, you’ll be paired with an expert tutor who has years of experience in the industry stream you’re studying. You’ll submit your design assignments through the Online Student Center and receive valuable audio feedback that you can use going forward. As a result, you’ll learn and improve throughout your online design course – QC’s tutors love seeing their students succeed! Be inspired by fellow students and graduates, stay up-to-date on the latest design trends, and share experiences. Follow QC on social media and dive into QC’s blog for designers, The Focal Point.